Peltogyne porphyrocardia Griseb. ex Benth. It is a dominant tree, it attains heights from 30 to 45 m, with a diameter at breast height between 45 and 90 cm or more. The boles are straight and cylindrical. It is found in the tropical forests of northern South America. Wood diffuse porous. Vessels solitary and in short radial multiples. Tangential diameter of vessel lumina 100 micras or less (very small). Occasionally vessels with colored deposits. Occasionally white deposits in heartwood vessels. Vessels per mm2 more than 2 Axial parenchyma in marginal or in seemingly marginal bands. Paratracheal axial parenchyma scanty and/or vasicentric. Occasionally axial parenchyma storied. Prismatic crystals in chambered axial parenchyma cells and/or in fibers. 3 to 4 cells per parenchyma s 4 to 10 rays per mm (medium). Rays non-storied. Larger rays more than 4 seriate. Homogeneous rays and/or sub-homogeneous rays (all ray cells procumbent). Fibers with simple to minutely bordered pits. It has no distinct odor or taste. The sapwood and heartwood are clearly differentiated. The heartwood is described as bright purple upon exposure. The grain is typically straight, sometimes interlocked. The wood has a medium to fine texture. The wood has medium to high luster. The heartwood is resistant to decay fungi attack and to termites, but it is less resistant to marine borers. It is very difficult to treat, but for most applications preservative treatments are not required. Ease of Drying: Drying is rapid. Drying Defects: Moderate cupping and bowing are reported. Casehardening is reported to be severe. Peltogyne is reported to be moderately difficult to saw. Tools usually require frequent sharpening. This species is interesting for slicing, thermal treatments are recommended. Cutting tools may be gummed up if they are not very sharp. Blunting is rated as moderate. Peltogyne is reported to be moderately difficult to work in most machining operations including planing, turning, boring, and molding. They respond rather poorly to ordinary tools, and working with dull cutters may cause the wood to heat up. A reduction of the cutting angle to 15 degrees is required, when wavy or interlocked material is present, to obtain satisfactory results in planing. To get good results in mortising end support is needed. The wood requires to be pre-bored, but nail-holding capabilities are reported to be good. The material is reported to be easy to glue. The material is reported to be fairly difficult to sand. Organic solvents remove the characteristic purple color. To preserve the natural color, wax finishing is recommended. 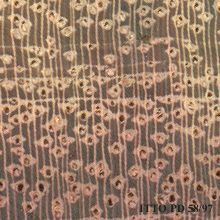 For this species water-based finishes are reported to hold color better. 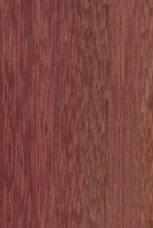 The use of spirit finishes may remove the purple coloring in the wood. Polishing properties are reported to be rather good. The wood steam bends fairly well. Response to hand tools is reported to be only fair.